Total crop failure is, fortunately, a thing of the past ... nonetheless, growers must remain alert. A pathogen responsible for a plant disease that has caused food shortages and major loss of life in the past, such as the Irish Potato Famine of 1845, still poses a significant threat to global food security. This is underlined in a new study from the James Hutton Institute, the Sainsbury Lab and other partners, which has also found that the problem is particularly acute in emerging countries in Africa and Asia. Through DNA-based forensic analysis, research leader Dr David Cooke and partners describe the emergence and spread of highly aggressive lineages of Phytophthora infestans, the pathogen that causes potato late blight, that have rapidly displaced other genotypes in Europe, making the plant disease more difficult to manage. Dr Cooke explained: “Pest and pathogen losses jeopardise global food security, as proven by the devastating spread of late blight across European crops back in 1845. The new lineage raises a worldwide food security issue as it has already spread beyond Europe – where it was first detected – to North Africa, India and China, threatening the livelihoods of communities relying on potato for food and income. “The disease proved more difficult to control due to a combination of increased aggressiveness, an ability to overcome some sources of cultivar resistance and its resistance to a key fungicide. The emergence and spread of this fit and aggressive lineage within the European pathogen population highlights the evolutionary potential of the pathogen and its destructive powers. This research study is remarkable in that it combines field work with genomics in order to explain the pathogen’s ability to overcome the resistance of the potato plant. “Such collaborations are uncommon but will be increasingly important in tackling dramatic changes in pathogen populations that threaten global food security,” Dr Cooke said. The scientific study also stresses the importance of disease management strategies for the preservation of one of the world's most important staple food crops. Paper: Cooke, D.E.L., Cano, L.M., Raffaele, S., Bain, R.A., Cooke, L.R., et al. 2012. 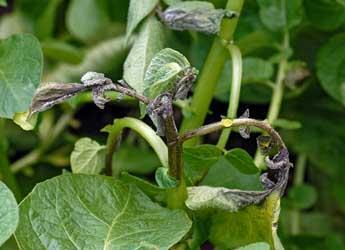 Genome Analyses of an Aggressive and Invasive Lineage of the Irish Potato Famine Pathogen. PLoS Pathogens 8(10): e1002940.